We flew from Palma to Marseilles and picked up a rental car at the airport. Automatic, no less! Very unusual for Europe. Although we weren't planning to stay in Marseilles, we wanted to see the harbor area. We ate lunch in the Old Port before heading on to Aix. The Mucem near the old port of Marseille, with a Picasso exhibition running at the time. There were a lot of fountains in Aix, apparently a reminder of it's days as a spa town. This one was at the very heart of the city. Fountain of the Rotunda dating from the mid 19th century. The three figures represent Agriculture, Fine Arts and Justice. The main street was pedestrianized, although the tourist tram still ran down the center. As you would hope and might expect in a city like Aix, there was a street market selling arty-crafty things (pictures, jewelry etc). We visited a Turner exhibition at the local art gallery, the Hotel de Caumont. Of course, no photography was allowed inside the building ! However, the exterior was impressive and there was a very distinctive formal garden (complete with cafe) inside the building. On the way to Avignon, we stopped at the small mountain village of Roussillon. The whole village was almost "too" pretty ! Finally, a quiet, shaded spot for a drink. We stayed in Villenueve, a small village just across the River Rhone from Avignon, which is the main town. Originally, the "Pont" as in "Sur le Pont d'Avignon" connected the two cities, although the bridge was abandoned in the 17th century. We stayed at the Hotel de l'Atelier, which was right in the center of Villeneuve. The lounge at the hotel. The big attraction in Avignon itself is the Palace des Papes, which for seventy years in the early 1300's was the center of the Roman Catholic world. It was built by Pope Clement V who wanted to get away from Rome following riots after his election. It was the largest Gothic Palace ever built. This model of the palace some some idea of it's scale. Outside, in the palace gardens, are great views of the surrounding countryside and the river Rhone. Below is the famous "Pont d'Avignon" more correctly known as Pont Saint-Benezet. Saint Benezet had a vision in which Jesus asked him to build a bridge across the Rhone. There isn't much of it left. Originally it went all the way across two arms of the river to Villeneuve on the other side and had 22 stone arches. When completed, it was 900m long. There's a small chapel built on the bridge, the Chapel of St Nicholas, built in the 12th century. Of course, we had to actually walk out on the bridge, although there isn't a lot to see. It was a very windy day! After all these years of humming the song, we were finally "Sur le pont d'Avignon" although there was no dancing that day ! Our next stop was Arles, but on the way, we stopped to see a very famous Roman aqueduct, the Pont du Gard. It was built as part of a 50 km aqueduct from Uzes to Nimes in the first century AD. When first built, it carried an estimated 44,000,000 gallons per day ! Our next stop, the same day, was in Nimes. We spent most of our time in Nimes exploring the Arena of Nimes, built by the Romans around 70 AD. It can seat about 16,300 people and would have been used by the Romans for Gladiator fights, as well as various other entertainments. After the Romans left, it was used as a fortress. Later it became a small neighborhood, filled with houses. The houses remained until the 18th century, when it was converted to it's present form as a bullring. Now it's used for bullfights twice a year but other events are held from time to time, as can be seen in the picture. The passageways which connect the interior with the exterior are very impressive. We also spent a lot of time learning about Gladiators. Who knew that Gladiators were rarely killed in the arena, because they were highly trained and highly prized? If one DID die, the owner of the gladiator doing the killing had to pay the owner of the killed gladiator ! After leaving the amphitheater, we walked back to our car through the town center. There was an unusual alligator fountain in one of the squares. We stayed in Arles in the very center of the town, which made getting a car in and out very tricky and we had to park about 500 m away in a commercial car park, which was a little inconvenient. We also had to drag our luggage up and down three flights of stairs. No elevator ! We are getting too old for this! ! We also had an interesting view from our window - another roman amphitheater, although not as grand as the one in Nimes. The view from our bedroom window. No bullfights or sword fights while we were there, although it looked and sounded as though the local schools were rehearsing a musical. Arles itself was a pretty little town with a pedestrianized center surrounded by very busy streets. Perhaps the largest square we found, filled with restaurants, including the one where we ate the mussels ! Of course, Arles is famous for it's connection to Vincent Van Gogh, who lived there for over a year in 1888. In 1889, he suffered a psychotic episode and famously cut off his ear and gave it to a prostitute (!). He was later voluntarily committed to a psychiatric institution in Saint-Remy de Provence. So first stop was the Vincent Van Gogh Foundation. Although the museum had mostly minor works by Van Gogh, there was a nice self portrait and one or two nice oil paintings. The other place we wanted to visit, which was outside Arles, was the Camargue. The Camargue is a large river delta (over 360 square miles) and consists mostly of marsh and water. It's famous for it's bird life and the wild horses which live there. The area is also famous for breeding bulls, which are sent to Spain for bullfights, but we didn't see any the day we were there. These horses were conveniently grazing at the side of the road. On the edge of the sea is the small town of Saintes-Maries-de-la Mer. It must have been market day. The Church of Saintes-Maries-de-la Mer. The niche in the wall ("The High Chapel") above the altar supposedly holds the relics of Saint Sarah. They are brought down once a year for a major Gypsy Pilgrimage which takes place here once a year. 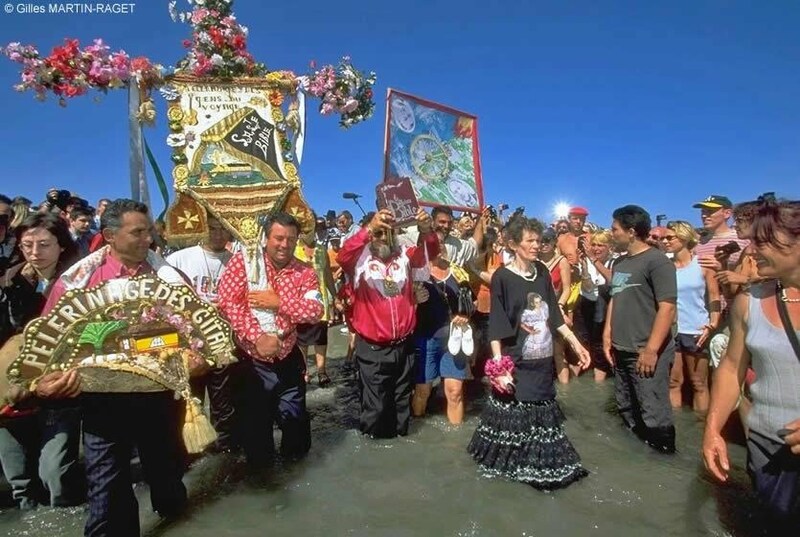 Gypsies come here to celebrate their saint, the Black Sara. We seem to have missed it by one day ! That night, after we got back, Kris became violently sick. All the symptoms pointed to food poisoning - whether from dinner that night or the mussels we had eaten the day before, we never could decide. She slept very badly and still felt terrible the next day. We were supposed to leave Arles that day but she was so ill, we wondered if she would be able to travel. There was also a market in Arles that day, so the streets were closed, which stopped us from bringing the car to the hotel. However, we did finally manage to get everything into the car and drove to Pezenas, which was our last stop in Provence. Kris went straight to bed and slept through until the next day, by which time she felt much better. Pezenas was a pretty little town, but the only reason we stayed there was to be near Bezier airport, which is served by Ryanair. It had a nice little shopping center. The next day, which was our last day in France, we visited Carcassonne, which was about an hour from Pezenas. Although the towers are relatively recent addition, they look old. The view from the walls over the town below. After seeing the old city, we drove into the more modern part of the town and took a ride on a boat along part of the Canal du Midi.The canal was built between 1666 and 1681 and connects the Atlantic with the mediterranean. 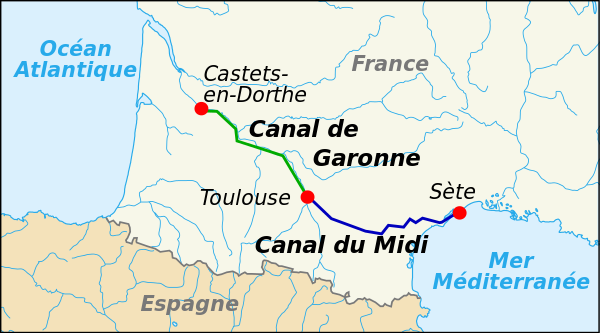 It was initially very successful, but by the 19th century railways took over and the canal fell into disrepair. Now it used almost exclusively for recreation. On our last day in France, we drove to Bezier. This picture was taken in one of the side streets off the main square. And from Bezier, home to Manchester.